World War II was a time unlike any other in the history of aerial warfare, and a time of extraordinary fighter aces. By the end of the war in 1945, many of the names of these brave young men had become household names across America, many of them retaining that fame for decades to come. A number of these great pilots lost their lives toward the end of the War, either in combat, training accidents stateside or for other unrelated reasons, so consequently were not as generally well known. Such is the case for the subject of this painting. The P-38 Lighting “T’Rigor Mortis” was flown by one of the 475th Fighter Group’s great aces, Francis Lent. In this scene, Lent is shown on the last mission in which he scored an aerial victory over New Guinea in 1944, in the last of his P-38 mounts, “T-Rigor Mortis III”. 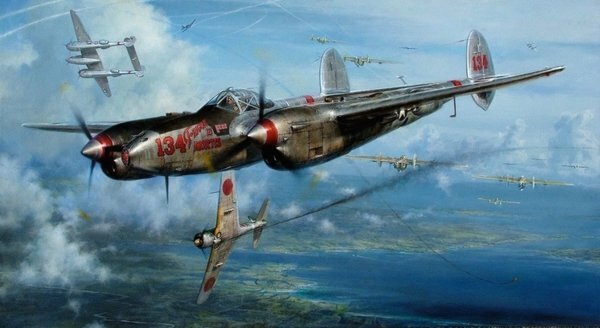 The politically incorrect title for this scene in which a Ki-43 ‘Oscar’ has been hit and is heading earthward was derived from an unknown P-38 pilot who, as he noted that his quarry had been hit, exuberantly shouted over his microphone, “No Saki Tonight! !” This is Shaw’s second scene saluting the legendary “Satan’s Angels” of the 475th, the first being “Pacific Summer”, his first WWII aviation painting published in 1993.